Here’s some insight on that first encounter between Myrtle Greer and Mable Stemple. 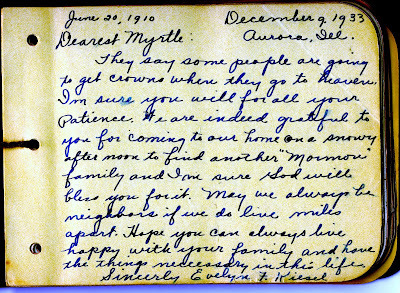 Although the Greers arrived in Aurora in June 1929, it was early winter before they found Sister Stemple, as attested in this note written by her daughter Evelyn Kiesel in Myrtle Greer’s autograph book in 1933. “We are indeed grateful to you for coming to our home on a snowy afternoon to find another ‘Mormon’ family,” she said. It’s no wonder that it took Myrtle a few months to find them—for all the obvious reasons, of course, but also because of a major financial reversal that the Greers suffered that summer. Remember, they had experienced three crop failures in a row, and they were already destitute. This is the house and barn that they owned near Cypress, Illinois. 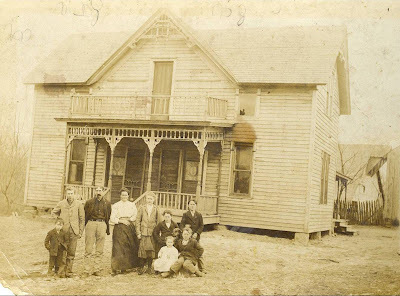 This photo was taken about 1910 and we see James T. Greer’s parents and siblings here. Jim is the boy standing on the far right. Jim and Myrtle bought the house and 40 acres from his father, Albert Jackson Greer, for $1,000 in about 1925. They had been so full of hopes and dreams. “We felt sure we were going to get rich there,” Myrtle recalled. As we’ve already seen, it didn’t work out that way. “Jim decided we’d have to go home and get the furniture. We got another payday, and I went down there, taking the kids too. I went down to the house and opened the door, and everything was gone. Not one solitary thing was there. Jim’s harness, his saddle, all of our bedding, all of our books, and everything we had was gone. 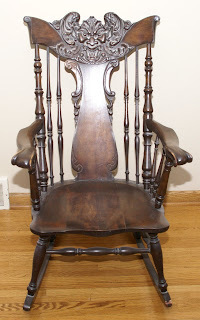 (We had some nice furniture, we really did.) I never cried so hard in my whole life. That about killed me. And there it was—nothing! 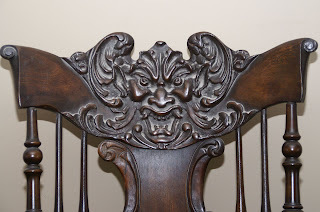 “We thought about it and prayed about it and decided to stay in Aurora and buy some furniture. We expected we could easily. We picked out the biggest bank in Aurora and we went to the head man, the president of it. We told him we needed $300, and we’d pay him back $10 a month. He thought that was the funniest thing he had ever heard. He says, ‘What have you got for security?’ Oh, we didn’t have anything for security, but Jim had a job. ‘Well, that isn’t enough,’ he said. No, that couldn’t do at all. The Greers later sold their farm in southern Illinois by placing an ad in the Aurora Beacon News. By coincidence, a neighbor, Mr. Fuller, who lived two doors north of them on Harrison answered the ad and bought the farm. “That let us out of the contract, and we took what money we got and put it on our house [710 North Harrison], and that was during the Depression,” Myrtle said. I believe that with her comment—“Then we really could have cottage meetings”—she acknowledges the hand of the Lord in their lives and affirms their determination to serve the best they knew how.